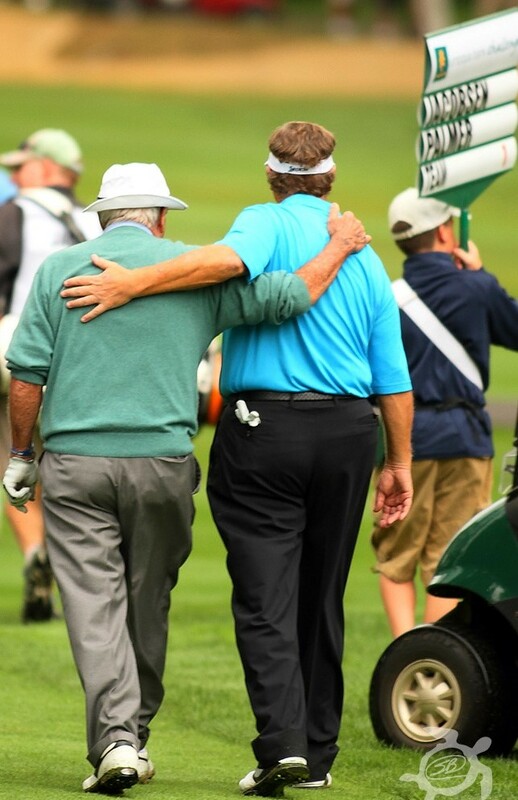 Arnold Palmer (left) and Peter Jacobsen share a moment at Palmer’s last appearance in the Northwest in 2011 at the Umpqua Bank Challenge at Portland Golf Club. I watched the debate last night, but only after seeing “Arnie” through again on the Golf Channel. I let the DVR cover the early-round insults and lies while I made sure I hadn’t missed any segments in the 2014 mini-series about Arnold Palmer, which was looping continuously on Monday, the day after his death. Just checked — the Golf Channel has moved on to the Ryder Cup, and Brandell Chamblee and David Duval were arguing, not all that civilly. CNN hadn’t moved on past the debate as of today, worrying over the winner and the loser, as if it was something other than obvious or all too obvious, I couldn’t tell which at a glance, which means they can keep it up well into October, until the next debate. We wonder about police shooting black men and how we feel when Colin Kaepernick insists on a protest. Speech is free, opinion is cheap, and what I know is Kaepernick didn’t play Sunday when the Seahawks drummed the 49ers. I know the smartest voice in this debate, Doug Baldwin, caught eight passes for 164 yards and a touchdown. Arnie was a Republican, everybody knows that, but he came from another era of the party, another lifetime, when it could claim Abraham Lincoln and keep a straight face. His politics were closer to the old-language roots — Middle English politic, Greek politikos — which meant things like civic, civil, the commonwealth, citizen. Today we speak truth to power, or some of us think we do, while others of us speak power over the powerless. Arnie seemed to speak in the Old Latin — populus … people. Golf was incidental to Arnie’s power, which drew from the people and radiated back among them. He was of the people, about which there can’t be much debate. About Citizen Palmer… Many thanks. You are spot on with your remarks about Arnie. Perfectly framed within the context of “Old” vs “New” politics. A man of the people, to a degree few have achieved on such a vast stage. Thanks, Tim. Never met the man. Wish I could have.